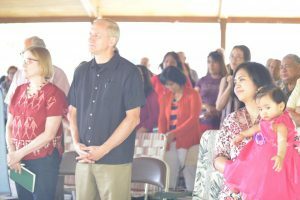 With illustrations from barren trees in the wintertime and personal stories of frustration around his infant daughter’s eating habits, Pastor Beny Krisbianto reminded a joint gathering of Nations Worship Center and Plains Mennonite Church on Sunday, August 27, of God’s goodness that meets us again and again in times of struggle and adversity. The joint worship service in the Plains Park pavilion was a clear example of God’s good and surprising work. Sharon and Dr. Conrad Swartzentruber (far left) in the joint worship service. In the worship service, a generous offering was received that was divided in half to support the ministries of both congregations, including the renovations of the second floor of the Nations Worship Center building.Preaching from Romans 8:28-39 in his native language of Indonesian, and interpreted into English by Plains member, Dr. Conrad Swartzentruber. Beny spoke about a God who works beside us in every situation we face and who met the needs of Nations Worship Center throughout the long, trying process of buying and renovating their current church building and dealing with obstacles from the city, neighbors, and contractors. But surprisingly, Beny shared, Philadelphia Mayor Jim Kenny recently attended a congregational service and wants to come back! 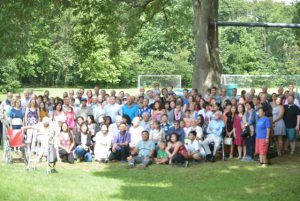 All total, by bus, a van, and several cars, 60-70 members from Nations Worship Center in South Philadelphia made the trip to Hatfield and Harleysville. It was noted in the worship service that the Plains congregation would look forward to another joint service with Nations Worship Center, only this time in South Philadelphia, and that many of the Plains members would also appreciate the convenience of bus transportation to ease the challenges of city driving, following directions, and parking. God is good and faithful, a reality we often experience in new situations that stretch us and take us out of our familiar routines.